Desk lamps provide “task lighting” for reading, writing, studying, crafting, computer work, and more. Clear, bright light that’s easy to work beneath. Relatively focused beam with minimal glare. An adjustable design that can be positioned to accommodate a range of tasks. In general, incandescent bulbs provide a bright, clear light. 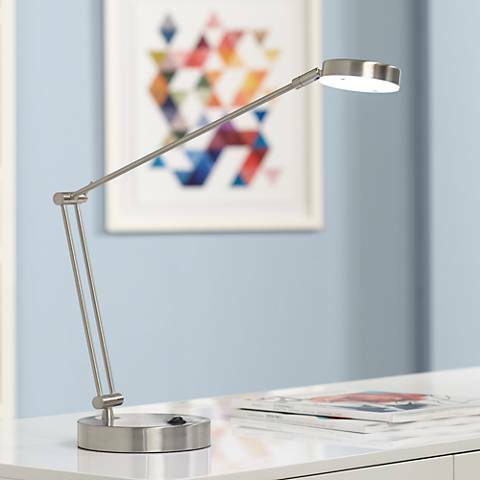 LED desk lamps offer a versatile and energy efficient option. Pay attention to these two characteristics: CRI and Color Temperature. Color Rendering Index (CRI) measures how true-to-life colors look beneath a given light source. This rating is especially important with desk lamps, where the ability to see contrast while reading and working is essential. Look for LEDs with high CRI ratings between 85 and 100. Color Temperature is a standard measure of a light’s appearance, often referred to as the “warm” or “cool” look of a light. LED desk lamps in the color temperature range of 2700K to 4500K generally provide a clear and pleasing light to work beneath. 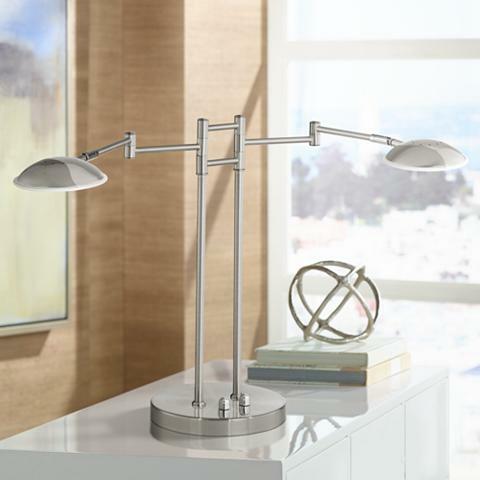 Another tip to help you buy a desk lamp is adjustability. 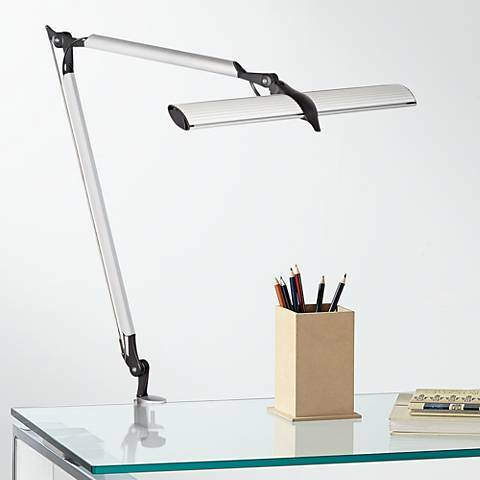 Adjustable desk lamps allow you to fine-tune the placement of the beam for specific tasks and to minimize glare. There are various possible points of articulation, including swiveling heads, swing arms, boom arms, and goosenecks. For small desks, choose clip-on lamps or lamps with small bases to preserve precious desktop space. For large desks, consider a lamp with extra reach (such as an architect or swing arm design) or use additional light sources in the room to ensure full coverage of your desktop. As a general rule, your light source should be positioned higher than your head but out of your eyes; it should never be in direct line of sight. Too low and it may not provide enough coverage for your work area; too high and the light may become too diffused. The lamp should be placed so that shadows don’t streak across your desk as you work. If you’re right-handed, this means placing the light source on the left side of your desk and vice-versa. 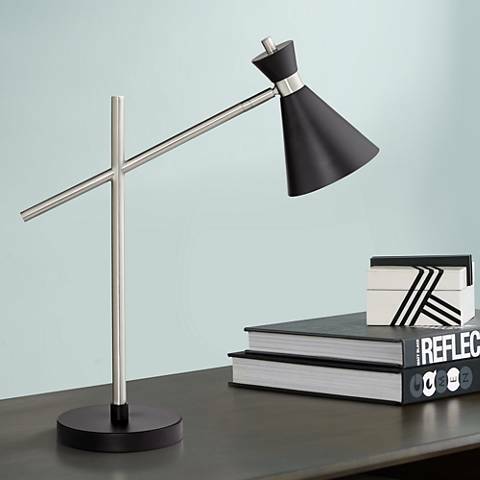 For adjustable lamps, make sure the arm is long enough and flexible enough to shine light where you need it, and out of your way when you don’t. When used with computers, desk lamps should illuminate the desk and keyboard without causing glare on the screen. Turning your desk lamp on and off should be easy. Good on-off switch options include pull chains, base switches, and touch operation lamps. Adequate reading light is increasingly important as we age and our vision declines. In fact, studies have shown that people in their 60s need up to 80 percent more light for reading than people in their 20s. Other symptoms may include reduced color discrimination and sensitivity to glare. To offset these symptoms, we recommend choosing a desk lamp with high contrast/high CRI and, multiple levels of brightness if possible. Be sure to position your lamp so that it provides ample light with minimal glare. 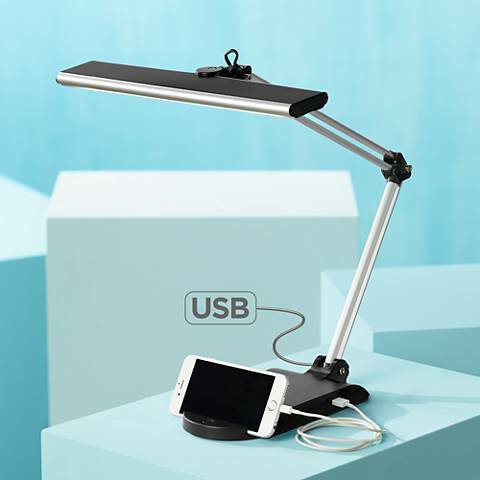 Another feature to consider are USB desk lamps. These designs have a built-in USB port that allows you to charge smart phones and other electronics quickly and easily. Many also have built-in electrical outlets that offer even more functionality. So-named for the professionals who made them popular in the early 20th century, these banker-piano lamps feature a distinctive oblong glass or metal shade that helps to focus light right where you need it.